The “Meow” sound library provides all the core cat vocalizations you'll need in a single package. Using 11 different cats cherry picked for their characters, this library provides over 272 vocalizations for your productions. From sweet mewls, to longing cries, or vicious shrieks, this library has got you covered. This library also includes the Sonic Worlds “CAT” sound pack. 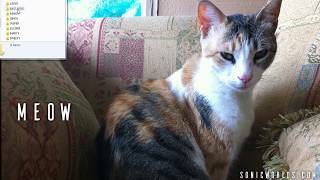 A lunatic Calico. A treasure trove of enraged vocalizations. Sweet natured Russian Blues for that soft gentle character. A nasty mean tomcat, hence his name. A Tabby with a rich growl. Deep threatening growls and hisses. A Ginger in a foul mood. Whiny sounding Ginger cats. For those hungry begging cries. Classic meows that work like a charm. A sad sounding Tabby cat. For those longing mewls that will break your heart. An absolute sweetheart black cat. Purry meows galore.